Recently, Piper Jaffray Cos., an investment bank and asset management firm, said virtual reality will be the “next mega tech theme” and grow into a market worth $60 billion in 10 years. 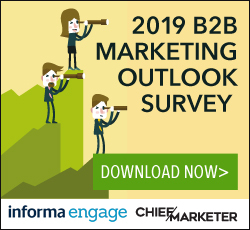 If marketers want to take advantage of this game-changing technology, they should take notice now. Here’s some interesting examples of companies using VR as a marketing tool. One of the major marketing uses of virtual reality is to provide customers with experiences that will convince them to physically visit a location or event. Not all brands, however, have physical locations or events to market. In these cases, virtual reality can be used to market a lifestyle. Earlier this year North Face unveiled virtual reality experiences in its Manhattan store. Viewers were able to experience hiking, rock-climbing and base-jumping through virtual reality. The goal was to excite shoppers about the outdoors, and then for them to use the company’s gear on their next adventure. In June, Zumba released a 360-degree virtual reality exercise video led by company co-founder Alberto Perez. The video shows Perez leading a three-and-a-half-minute class, and was shot in a way that allows viewers to either participate in the routine or mimic what it’s like to teach a class. With the release of the virtual reality experience, Zumba can market to both first-timers and those interested in becoming instructors. Colleges and universities have been among the earliest adopters of virtual reality, and are using this new tech to reach and engage with prospective students. The Savannah College of Art and Design (SCAD) is at the forefront of this push. This spring, SCAD mailed 5,000 inexpensive, branded virtual reality headsets to students who were accepted into the school, but had not yet enrolled. SCAD’s hope was that students would use the virtual reality headsets to explore its campuses and picture what it would be like to attend the school. The school has plans to expand its program by sending headsets to targeted high schools and teachers, as well as to create virtual reality experiences of university exhibitions and events. Embry-Riddle Aeronautical University in Daytona Beach, FL is also among the growing list of colleges and universities utilizing virtual reality, though the school is using a different method than SCAD. While SCAD mailed students headsets, Embry-Riddle has outfitted some of its admissions professionals with virtual reality headsets, so they can engage prospective students at recruitment event at high school and colleges fairs. Because the technology is so new, Embry-Riddle and other schools are drawing large crowds of perspective students, who want to experience virtual reality—whether or not they may have initially been interested in the university. This leads to more one-on-one interactions and opportunities for the admissions professionals to educate students about their school. 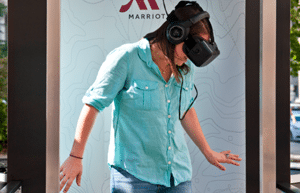 Last summer, Marriott rolled out its own virtual reality experiences as part of its “Travel Brilliantly” campaign. For one aspect of the campaign, Marriott built large booths, dubbed “Teleporters,” that transported viewers into virtual reality versions of London and Hawaii. In addition to virtually experiencing a location, the company enhanced the experience by adding heat and mist. 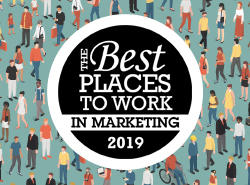 Michael Dail, vice president of Marriott Hotels brand marketing, told Wired his company hopes people will become inspired by the experience and decide to book a trip. He added that another goal of the campaign was to help the hotel group build credibility with younger, often more tech-savvy, travelers. While Marriott International is using virtual reality to showcase destinations, Ultimate Jet Vacations (UJV)—a boutique tour operate in Miami, Florida—is using the technology to grow its business and help hotels market their properties. Using virtual reality, hotels can allow potential guests to step inside and experience their properties before they commit to booking. Peter Frankhauser, the company’s CEO, said at a recent shareholders meeting that he believes the technology will eventually take off on a mass scale. 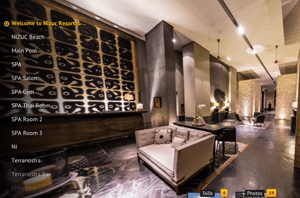 “We believe that as (virtual reality) becomes more widespread, we will be well positioned to deliver 3D hotel and destination experiences via our website to customers in their homes,” Frankhauser said. Anchor Associates, a brokerage in New York City, is using virtual reality in several ways to provide its clients with a better understanding of its properties. The company has partnered with YouVisit to provide several of its real estate agents with easy-to-use 360-degree cameras in order to quickly create virtual reality experiences of properties that are viewable across all leading virtual reality headsets. After they’ve created the virtual reality experiences, real estate agents have the option of giving clients an inexpensive virtual reality headset, so they can tour property from anywhere; agents might also invite clients to their offices to view many properties at once in order to whittle down their list of potential spaces. In 2014, TomorrowWorld partnered with YouVisit to create an immersive virtual reality experience. The experience captured what it was like to spend three days at one of the world’s largest electronic dance music festivals. The experience captured not only concerts, but also every major section of the festival site, including its campground. TomorrowWorld used the experience to market the entire festival in hopes of wooing potential concertgoers with an immersive experience that emulated being there. TomorrowWorld’s virtual reality experience was made available on leading virtual reality headsets. Last year, HBO partnered with Framestore and Relavent to create a virtual reality experience to help market the mega-hit “Game of Thrones.” Using an Oculus Rift, wind machines, rumble packs and real elevators, the companies built an experience that allowed users to enter an elevator that ascended “The Wall,” a massive ice structure that’s one of the TV show’s major locations. Recently, Birchbox Man—a monthly service that provides grooming products samples—announced that in August subscribers would receive a cardboard VR headset and instructions that prompted subscribers to download four branded VR experiences to their smartphone. According to Adweek, Birchbox doesn’t have plans to create more VR content, but it is uniquely positioned to do so, as a large percentage of its subscribers will have a VR headset going forward. Abi Mandelbaum is co-founder and CEO of YouVisit.